Even though Bryce Harper remains in Washington and his team didn’t make any blockbuster deadline deals, it was a tumultuous day at Nationals Park. Forty-five minutes before Tuesday’s 4 p.m. 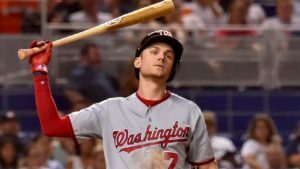 ET non-waiver trade deadline, shortstop Trea Turner held a news conference in regards to offensive tweets he made in 2011 and ’12 that surfaced over the weekend,. The tweets included a gay slur, anti-gay comments and a joke with racist undertones. It’s a distraction that the Nationals can ill afford right now. After Tuesday’s 25-4 win over the New York Mets, Washington (53-53) sits in third place in the National League East, 5½ games behind the the first-place Philadelphia Phillies. After Sunday’s 5-0 loss to the Miami Marlins, Turner released a statement apologizing for the tweets that had surfaced earlier that day. On Tuesday, he elaborated on that apology. Turner hit leadoff on Tuesday and went 4-for-6 with three runs scored. He didn’t receive a notable reaction from the crowd in Washington ahead of his first at-bat, then he singled, stole two bases and scored on a Harper double. That was part of a seven-run first, the team’s largest opening inning in over three years and the most first-inning runs by any NL team this season. It ended the night with a franchise record 25 runs.